Bollinger Bands® create a channel of a standard deviation based on a moving average (typically the 20 ma). In order to determine how far the bands are from the mean (20 ma), the outer bands are a specified number of standard deviations (typically 2) from the mean. 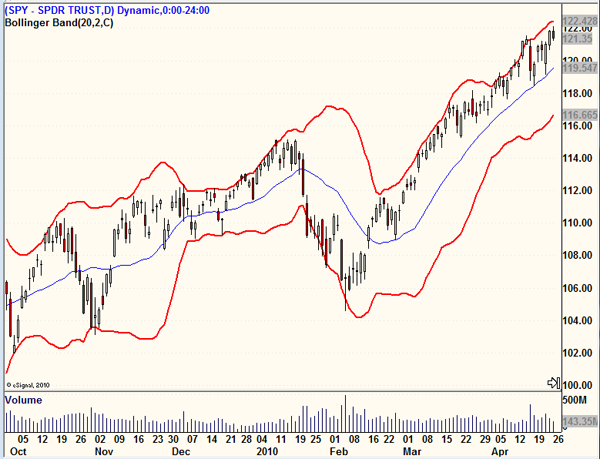 Background:Developed by John Bollinger, these bands adjust themselves to varying market conditions. In volatile times, the bands widen, while in less volatile sessions, the bands constrict. Practical Use:Traders will often use Bollinger Bands as additional trade confirmation in addition to studying the price action and volume during the timeframe under assessment. They will also use them as overbought and oversold levels for entering trades or simply avoiding opening a new position.